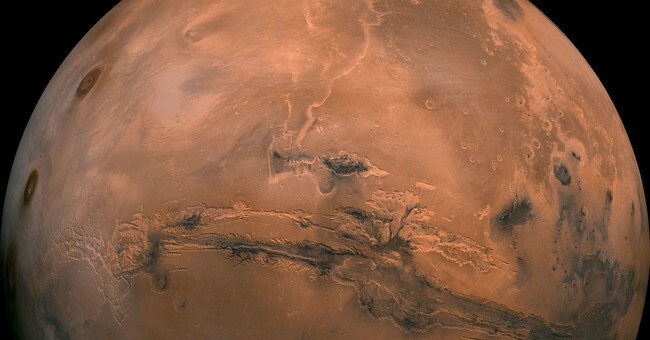 Scientists just announced that they’ve located signs of methane on Mars, a gas that does not necessarily indicate biological life, but rather points them in the right direction. It’s an interesting discovery, despite the fact that none of us will probably be alive to really see where it leads. We earthlings have been obsessed with finding life on Mars for decades. We’re excited to see methane gas on a different planet and liken it to life, yet in American courtrooms, statehouses, and our nation's capital, lawyers and politicians are squinting at ultrasound pictures, proclaiming... maybe? Ever since human beings turned dreams of space exploration into reality, we’ve been hooked. The concept of our existence as a microcosm in a seemingly endless universe fascinates us – rightfully so, of course. In an expanse that appears to have no limits or end, it seems small-minded to assume that we’re the only life forms floating around. We haven’t exactly located any intelligent space aliens, but we have spent billions of dollars straining to find something we can call life on Mars. The United States launched our first satellite orbiting the Red Planet in 1971 (and we’ve completed about 40 Mars missions since then). We have spent half a century, billions of dollars, and countless man-hours struggling to find something, anything, that we can call LIFE on Mars. We’ve spent about that much annihilating pre-born life on Earth with our half a billion-dollar check to Planned Parenthood every year. So what kind of psychotic disconnect do we have that allows us to get excited about gaseous “life” on Mars but ignore every scientific fact that states human fetuses are life on Earth? We strain to find any kind of living particle or cell light-years away but bend over backwards on Earth trying to ignore it in the womb. Our disgraced politicians in Washington D.C. have lately been bickering about whether it’s OK to let born-alive abortion survivors die in a bucket after birth. When asked about it, Pelosi spokesman Drew Hammill called the GOP measure "yet another front in the Republican war on healthcare." Jacqueline Ayers, a vice president for Planned Parenthood Federation of America, said Republicans were "shaming women and criminalizing doctors." But perhaps the “doctors” should be ashamed if they withhold healthcare—usually defined as care that contributes to health rather than death of an infant. Words are one of mankind’s most lethal weapons. If all that is needed to justify the termination of human beings with sharp tools and serrated vacuums is to rename death “healthcare” and “choice,” more lives will end as abortionists experience no consequences for building a gruesome business. Meanwhile, our schizophrenic society claims that abortion is permitted because a pre-born baby is not a living person while following the Mars explorations for signs of life like an interstellar soap opera. Someone must explain why gas is a sign of life, but a beating heart is open to interpretation. It’s the height of intellectual discontinuity and hypocrisy to claim respect for science while ignoring basic embryology. Rest assured, there are still people out there using the “it’s not a living human” playbook. Some pro-choice activists are intellectually honest about what’s going on – that abortion ends a human being’s life. What follows this logic is as sinister as the former is idiotic. Evolution News outlined the disturbing new reality of the argument for abortion in this article about an interview with Willie Parker, a “Christian” abortionist in the deep South. We know we’re ending human lives; but the fact that we won’t call them “people” is what makes it OK. Ignoring people's humanity destroys a culture as detailed in countless chapters of world history looking at slavery, women’s rights, and genocide, et al. Yet here we are again. When personhood is defined as “human + something else,” that’s when It’s possible to justify the death of the innocent.